These burgers may be served with a salad, as I did, but also on a bun with your favorite toppings. This recipe yields 10 burgers (1.5 oz each). 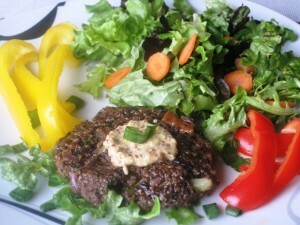 Serve with your favorite topping, or with a dollop of Coarse Ground Dijon Mustard, as I did. Mash, or pulse in food processor, 1.5 cups of Black beans. Set aside the remaining 1/2 cup of beans. In a saucepan, add 1Tbs. oil, and saute the onions and garlic for 2 minutes. In a large bowl, mix the mashed beans, mushrooms, onions/garlic, all seasonings. Fold in the broccoli and 1/2 cup of reserved beans. In a separate bowl mix the eggs with Panco crumbs, quick oats, and Parmeson cheese. Fold into the bean mixture. Line a cookie baking sheet with foil paper, spray with cooking spray. Using 1/2 cup of mixture, form burgers. Place burgers on the greased pan, brush tops with olive oil. Bake in preheated oven, at 350 F, for 4 minutes per side, turning them over once halfway through. Remove from oven, brush tops with olive oil (optional), and serve.